Lifespan on record: 122 years and 164 days. 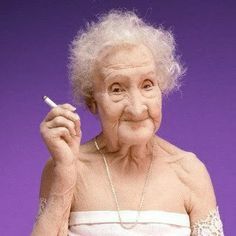 When Jeanne was 114, she starred in a film about her life; at 115 she had an operation on her hip, and at 117 she gave up smoking (having started at the age of 21 in 1896). Apparently, she didn't give it up for health reasons, but because she didn't like having to ask someone to help her light a cigarette once she was becoming almost blind. She signed a deal to sell her apartment to a 47-year-old lawyer called AndrÃ©-FranÃ§ois Raffray. "Being young is a state of mind, it doesn't depend on one's body, I'm actually still a young girl; it's just that I haven't looked so good for the past 70 years." Her attitude reminds me of my very healthy, 101 year old mother in law. She's a peach, in very good health (mentally and physically) and a joy to have around. Tip me hat to the grand old lady!